so said ellie: Should you choose to eat the marshmallow. Should you choose to eat the marshmallow. An earlier post reminded me of something that had been deep in my memory banks. On Gotland, we found a candy store. It sold raspberry licorice and other yummy things. It sold multicoloured marshmallows, which I do believe were actually tastier than any other marshmallow I've eaten. Ever. They weren't as sweet, but they were softer. And fluffier. They actually tasted like soft fluffy pastel cartoon clouds, I had Homer-Simpson-in-chocolate-land flashbacks (but marshmallows, not chocolate). 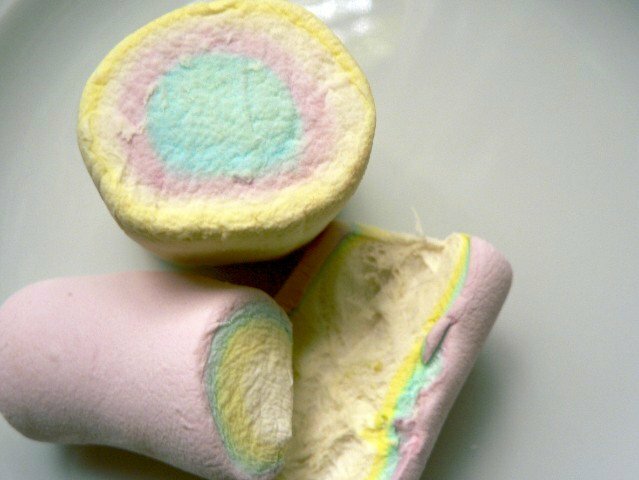 What I would give to be sitting by the Baltic, with the 10pm sunset, eating a Swedish multicoloured marshmallow.